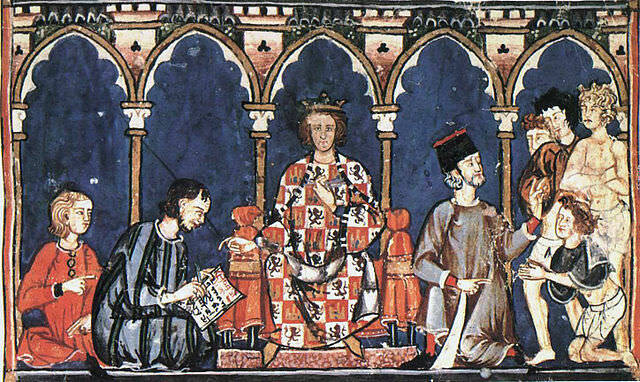 Alfonso X as a judge, from his Libro de los Dados, completed ca. 1280. Introduction: In 1984, many countries celebrated the seven-hundredth anniversary of the death of the most remarkable king in the history of the West, Alfonso X of Castile. The prototypical philosopher-king, he is aptly named El Sabio — “the Learned” or “the Scholar.” Half of his greatness lay in the man himself, in his polymath hunger to absorb all beauty and learning, to codify and reshape it, and to propagate it throughout his somewhat backward society with a missionary fervor. By the great creations he presided over and participated in, he intended more: nothing less than to reshape and elevate that society in its future generations. The other half of his greatness lies, as with any great man, in the extrinsic historical accidents down to the present day. For example, he is rightly called the founder of Castilian as a proper language, but he could not have foreseen that the language he helped fashion would by the commemorative year 1984 rank fourth in the number of native speakers on the planet. He created a vast encyclopedia of life and society, in the guise of a closet or literary code of law, but he could not have imagined how it would spread to Africa, Asia, and the New World and achieve “the widest territorial force ever enjoyed by any law book” and to become “one of the outstanding landmarks” not only of Spain’s actual law but “indeed of world law.” His code is vital even to the legal life of the United States; “civilized law began” with Alfonso’s code “in a considerable group of jurisdictions” here and can still be cited from Louisiana and Louisiana Purchase states to California and the Mexican War acquisitions. Alfonso’s contributions to science, music, historiography, poetry, fiction, and art were each unique, but they also became lasting and endlessly influential.